The character creation process has a few different parts to it. You must choose a name, a password, a gender, a race, and a class order. We'll start from the beginning. Please note, any images of this process were created as of January, 2010. 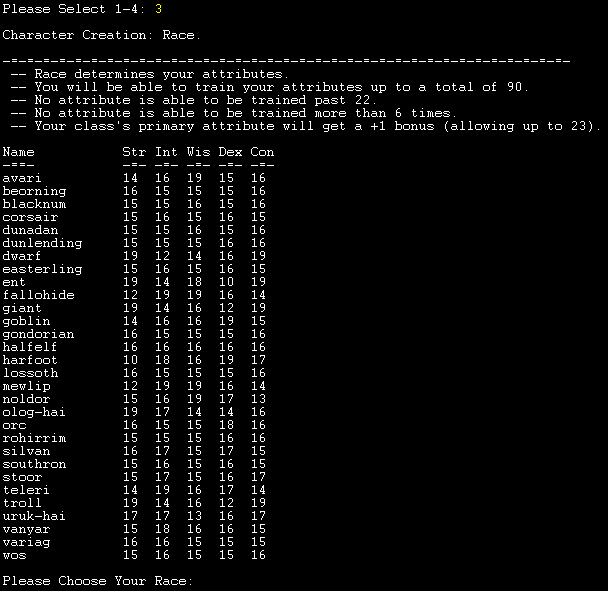 The basic setup process remains the same, while specific details may have changed (rewordings, race statistics, etc.). Also, any yellow text (below) is input. Anything that is white represents MUD output. When MORDOR asks you for a name, put in any name you wish to go by. If it is already taken by another player, you will be asked for a password. If it is an illegal name, as in one that has already been taken by a mobile, then you will be prompted as such and a new name will be requested. If it is a new name, you are shown a short disclaimer and asked to confirm it. If you do not confirm your name, your will be asked for a name again. Once you confirm your name, you will be prompted to enter a password, and then to confirm it. After doing this, you will enter the character creation menu. 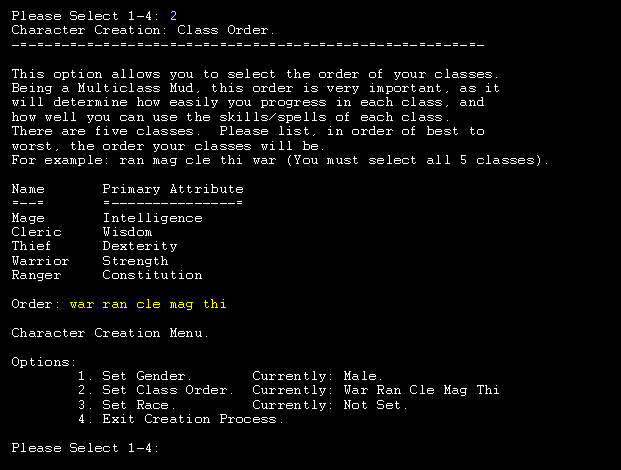 Within the menu, you can setup your character's gender, race, and class order. You may not exit (with option 4) until you have completed steps 1 through 3. You may re-enter any of the 3 steps as often as you like, until you are pleased with the setup. Now the race list can be slightly intimidating (shown in the second image below). 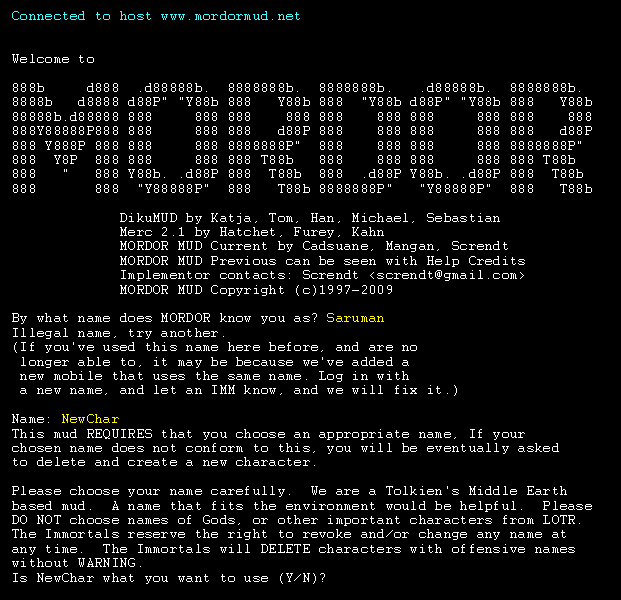 The player-run Mordor Wiki page has some input from the players about character set ups, found here. It also will give you some insight as to which class orders work well together, and what statistics you should focus on. In general, you want to base your statistics on your primary class the most, and then on your secondary class, etc. Statistics are explained in more detail in the 'Training your Stats' section on the FAQ page. Once you are done setting up those three menu options, look back over them again. Make sure they look satisfactory to you, and then choose the exit option to enter Mordor. You will start out in the newbie school, which will explain both the basics of MUD control and some specific features (and how to use them) of Mordor. 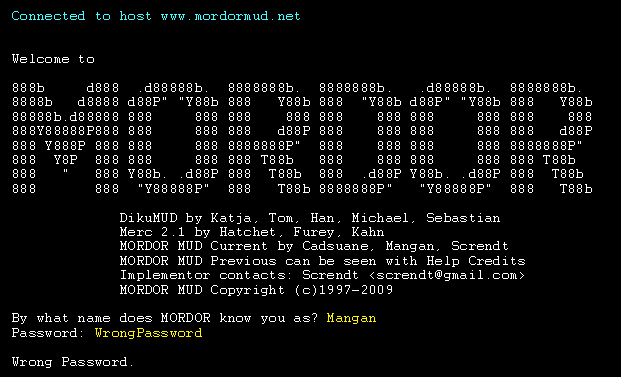 It is advised that anyone new to Mordor go through the school, at least skimming it over for the content that is not common to other MUDs. Between the newbie school and the FAQ page, you should be well on your way to becoming a seasoned adventurer in no time!